Ast pixín, L.Lophius piscatorius, Eng. monkfish. It lives in the Atlantic from the northeastern section to the Iberian Peninsula and is common in the Mediterranean. 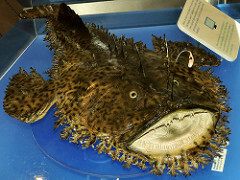 Monkfish have been described as "a tadpole almost the size and shape of a baby grand piano.” They are normally 40-60 cm. long. Lladonosa provides a modernized medieval recipe for monkfish fried and served with clams while Benavides-Barajas’ is cooked in a sauce. Finely chop garlic and fry in a little olive oil. When it browns, add one sprig of parsley chopped. Toss for a few seconds and put it in a mortar with the remaining parsley. Add the remaining olive oil to the frying pan and fry the bread until golden brown. Add it to the mortar. Fry the squash, chopped and without seeds, for a few minutes. Dip it in 1 ¼ qt of broth . If available; if not, use water. Chop the ingredients in the mortar. Add them to the broth and cook for five minutes. Add salt to taste. 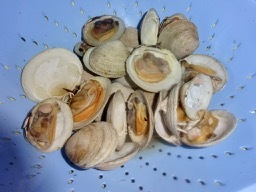 Put sliced fish in an earthenware casserole with clams seasoned with salt and pepper. and heat until fish is cooked, Dampen with sauce from the frying pan and cook until fish is cooked, about 10 minutes. Ingredientes: 30 clams or 1 kg, 1 tbsp onion, 2 garlic cloves, 1 tbsp flour, olive oil for sautéeing, 1 c white wine, oil, 1 tbsp parsley, salt to taste. Preparation: finely chop onion, gently sautée in a little oil. When they start to brown, add flour and mix until disolved. Cook for a few minutes. Add white wine, Mix well with the flour. Add clams and cook until they open. Sprinkle with chopped parsley and serve.